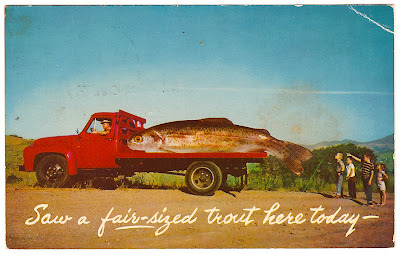 I haven't seen any fish as big as the one on the post card yet. The ones dad caught were about four inches long. So far he has only caught five. We have a nice little cabin up here in the redwoods. A river runs right below our cabin and Cheryl and I have been floating down it on rafts. Yesterday dad fell in the river when fishing. Will see you Monday. That fish was caught in either Montana or Wyo. That is a common size in those two states. I see postcards are 3 cents in 1959. 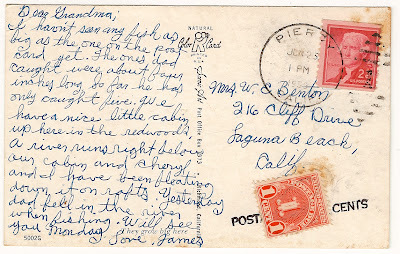 What a wonderful postcard - Uncle Jim knew how to write an interesting note. I want to rent that cabin! Don't come fishing here. Canadian trouts are smaller. I'm sorry to hear about your uncle Jim. Laguna Beach looks like a nice place to live. And regarding the trout; according to wikipedia the rainbow trout is over 16 inches long in Redwood park. But they can grow as long as 4 feet apparently.